Throughout my training, I’ve seen many labs leave my institution and many labs arrive, and I always thought, “I’m glad it isn’t happening to me” …until one day, it did. Toward the end of my second year as a postdoc at the NIH, my advisor took a position at Rockefeller University, and thus, the lab was officially relocating. So what happens to you when your lab leaves to go somewhere else? Here are some of my experiences along with several others who have volunteered to share their stories. I conducted a small twitter survey with 12 respondents, and the overwhelming conclusion is: You are not alone! Many graduate students and postdocs experience a lab move, and each experience is unique. “It’s easy to get frustrated and feel like you are alone”, one survey respondent comments. I hope this post convinces you that you’re in good company and provides tips and suggestions on how to deal with the situation. The decision to stay or leave is personal and circumstantial and often there are additional complicating factors such as timing in graduate school, the two body problem, or consequences of leaving the lab. Accordingly, survey respondents’ decisions varied, with one-third leaving the institution with their lab, one-third staying at the original institution, and one-third making some sort of compromise. No matter the final decision, all survey respondents recommend asking your advisor and administrators at both the old and new institutions a lot of questions before making your decision. “Ask about funding, classes, timelines, your official title/benefits at the new institution, their expectations, changes in the lab makeup (number of people, percentage of grad/undergrad students, etc. ), opportunities to collaborate with people at both institutions, who’s paying for the move, cost-of-living adjustments, etc.,” recommends Laura Tipton, now a postdoctoral fellow at University of Hawai’i Manoa. In addition to asking questions, it’s helpful to see how others have dealt with a lab move, what went into the decision-making process, and what advice they can offer. For some trainees, the best option is to move with the lab. 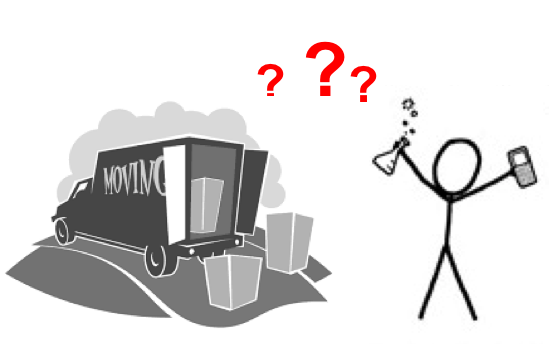 Many who move to a new location with the lab admit that the move enables them to meet new scientists with fresh or different perspectives, and this can greatly benefit research projects. However, be aware of additional moving pains. Inevitably, you will run into delays as it takes time to get projects up and running in the new space. For others, it made sense to move to the new institution with the PI, but stay a member of the original institution’s graduate program. Each institution has different requirements for trainees, so know what your institution allows and what the new institution will require. For example, some programs will not let you stay as part of the program without having passed the preliminary/qualifier exam in the second year. If you switch institutions, some may require you retake coursework or fulfill different requirements. Either way, ask questions and be aware of each institution’s policies and rules. Mackenzie Howard. “[Having a joint affiliation] meant traveling back once a year for committee meetings, and doing a lot more over email.” remarks Howard, now at the University of Texas at Austin. While it has worked for others in this situation, “Ultimately, this was not a good way to go for me” says Howard, since it made it difficult to establish connections with faculty at the original institution, especially when in the 4th year, his PI decided to leave science altogether. “I immediately contacted my dissertation committee and program head at the previous institution, and outlined what I thought I could do to finish my work. With the move and the delays, my committee didn’t think I could do enough in time to finish (they weren’t wrong).” Howard explains that, although offered the choice of returning to the original institution and starting from the beginning, he ultimately re-applied to other programs with a better understanding of what would be a good fit. “Overall, now that I’m done, I think it was the right decision. I was exposed to new ideas and collaborations I would not have had otherwise so it was the best decision for my career,” states Tipton on moving with the lab. However, “For my mental health, it may not have been the best decision as I was miserable living in the new city. Moving caused me to lose my support system, so part of me wishes I had been required to take at least one course at the new institution to get to know more of the grad students there,” she explains. Molly McQuilken. For McQuilken, who obtained her PhD from Dartmouth, the move was essentially a bargaining tool for finishing her degree. “I was starting my fifth year of graduate school at Dartmouth when we left, and I decided to go to the new institution after convincing my advisor I needed to graduate within nine months of moving,” explains McQuilken. She also admits to the hardships of moving away from her support network and trying to establish a new community so late in her PhD process, but settling on a concrete timeline for defending her thesis was a huge factor in the decision. Other times, the best decision was to remain at their original institution, but that may come with caveats. Often, staying means leaving your original lab and either joining a new lab, potentially losing several years of productivity, or starting a new job/career. Anonymous. This respondent explained that they were mentored by two PIs, and the one with funding ended up leaving the institution. Through some extra effort, the respondent was able to find funding so that they were fully mentored by the other PI and was able to remain at the original institution without too much disruption to their research. When I first heard the news that my lab would be leaving, I assumed I had two options: stay in the lab and move to the new institution, or leave the lab and stay at my original institution. Fortunately, as is often the case, my advisor and institutions were willing to make compromises on this front. I am a seasoned veteran of the “two body problem” and after 2.5 years apart, I was happily living in the same city as my fiancé when my lab decided to leave for New York. I wanted to stay in my current lab, but also live with my fiancé (Is that too much to ask?!). So my advisor and I have made an arrangement where I can split time between institutions. I do some work at my original institution (in the lab where we have an ongoing collaborative project), and then travel to Rockefeller for experiments, personal interactions, and resources. I was the sole lab member willing to move, and shortly after the transition I obtained a fellowship, so that helped negotiate the compromise. Not to mention, access to lab space and resources at the NIH made the transition smoother while things were getting set up in the new lab. While this may not be the perfect solution (and we are still working on a more practical long-term solution), I am not fully long distance from my fiancé, and I still get to continue being a part of the lab environment I like and doing the research I enjoy. Furthermore, being at Rockefeller has provided me with remarkable exposure to scientists, research, and resources that would not have been available if I stayed. Communicate and talk the decision over with others. Open lines of communication with your advisor, lab mates, and new (and old) institutions are critical to help you decide what’s right for you. “Without your mentor’s support for whichever option you prefer, you are likely to face a difficult battle,” remarks one graduate student. As for what to expect, one survey respondent explains, “Unfortunately, there is going to be a cost both if you leave or if you stay. You can’t get around it. If you stay, you need to deal with the loss of belonging to a productive lab environment. If you leave you will inevitably lose some time setting up both life and new lab workflows.” It’s important to keep an open mind about the experience and make the best out of the new situation. I recall some advice from ASCB member Dr. Enrique De La Cruz: “You can’t have it all… but you can have a little bit of a lot”. While you may not be able to have everything you had originally planned on by joining a lab, it is possible to make the most of this circumstance and be open to new experiences. The “right decision” will vary for everyone. Sometimes this requires sacrifices in personal relationships or timing or career trajectory. Importantly, don’t feel as if you are going through this endeavor alone. Taking care of your mental health is extremely important during this time. Many institutions offer free wellness and meditation courses for trainees, in addition to access to therapy, that can be really helpful especially if the decision is difficult or requires sacrifices. If you have any questions, want advice, or just feel like commiserating, please don’t hesitate to respond in the comments or reach out! The views and opinions expressed in this blog are the views of the author(s) and do not represent the official policy or position of ASCB.